We are just little over a week away from the release of B’z 50th single GO FOR IT BABY -kioku no sanmyaku- and the music video for said single has been posted on the band’s official YouTube channel today. I have uploaded the video for your convenience – especially if you are from a region where you cannot view it (e.g. Germany). Feel free to leave your opinion on the music video in the comments! Moreover, additional details regarding the Pepsi NEX special campaign have been unveiled. As you know, with the purchase of B’z new single you get the chance to win one out of two thousand B’z x Pepsi NEX special T-Shirts! All you have to do is send in the postcard that comes with the single. 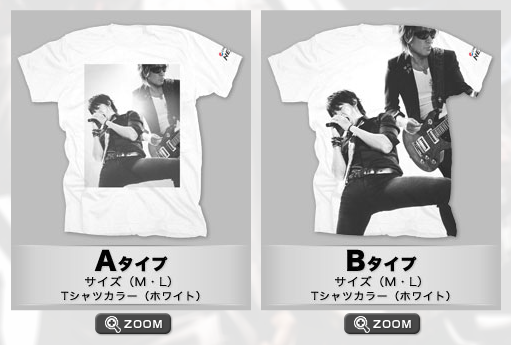 Now the designs of these T-Shirts have been revealed. When you receive your postcard with the single, you can choose whether you’d like type A or type B in case you are one of the few lucky winners. You’ll also have to choose your T-Shirt size (M or L only). Deadline for submission is April 30th, 2012. No clue… I’m gonna send mine in for sure. So, I won’t spend the extra money on sending this in… I will keep the coupon just for the “collection”. I guess. Thanks again for posting the video! !